Hand woven textiles are the new favourite in the ethical fashion world. Hand weaving, in particular back strap/loin loom weaving is an ancient art.A loom is basically a device used to weave cloth. There are many types of loom used in different parts of the world. The traditional loom used mainly by the tribal people of Northeast India is known as the back strap loom or the Loin loom. A simple loom holds the warp threads under tension to facilitate the interweaving of the weft threads. The precise shape of the loom and its mechanics may vary, but the basic function is the same. The tools used differ from loom to loom with the kind of pattern the weaver makes. 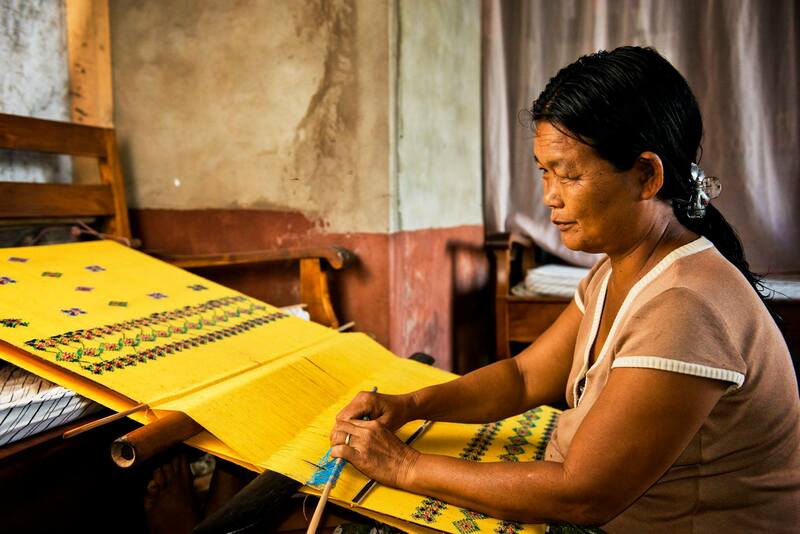 For centuries, tribal people have used this traditional way of weaving to clothe themselves. Moreover they have managed to invent designs and pattern which has become a form of identity they proudly preserve within their own community. Each tribe has their own design and pattern and they are basically color and simple designs intricately woven and beautifully crafted. With the back strap loom, one bar is attached to a fixed object and the other to the weaver usually by means of a strap around the back known as “Kawng vawn”. While weaving, two additional bars are attached on each end which is mainly used to tighten the loom so that it doesn’t move. The bar attached to a fixed object is known as “Poun Kam” and the other bar attached to the weaver with the strap is known as “Kol Ka”. Between the shed, “Pum Long” is inserted to keep the warp separate and easy to weave. One other thing called “Hnah Chawi” which comprise of two sticks is also used to regulate and divide the thread evenly. Simplified version of traditional weaving can be explained through the following steps: The shed is raised, the shuttle known as “Kho Thei” is passed through, the shed is closed, and the weft thread is beaten into place with a “Lhem”. These steps are then repeated, with a different set of threads being raised so as to interlace the warp and weft. Both simple and complex textiles can be woven on this loom. Width is limited to how far the weaver can reach from side to side to pass the shuttle. Warp faced textiles, often decorated with intricate pick-up patterns woven in complementary and supplementary warp techniques are woven by the people. They produce shawls,scarfs and puan ( a wrap) which is the traditional wrap around worn by the women.The finished products are used to make several things like fashion and home accessories.